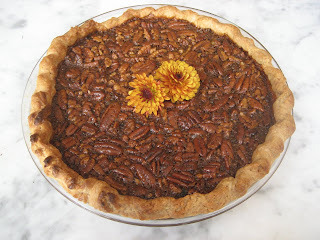 MUCH ADO ABOUT STUFFING: The Perfect Pecan Pie. Its FALL! The Perfect Pecan Pie. Its FALL! Bake for 5 minutes and check that shell is not puffing up too much (in which case gently prick) or browning too much. Quickly remove from oven. Carefully remove the parchment and weights, and return the shell to the oven for another 3-5 minutes until golden brown over all. Toast the pecans in a 350 degree oven for about 5 minutes, cool, and chop into small pieces. A pizza pan works well for this, as does a toaster oven. 1. Adjust oven rack to center position, and heat oven to 275F. Place pie shell in oven if not already warm. 2. Melt butter in a double boiler if you have one, or in a medium heatproof bowl set in skillet of water maintained at just below simmer. 3. Remove bowl from skillet; mix in sugar and salt with wooden spoon until butter is absorbed. 4. Beat in eggs, then corn syrup and vanilla. 8. Bake until center feels set yet soft, like gelatin, when gently pressed, 50 to 60 minutes. Transfer pie to rack; let cool completely, at least 4 hours. Serve pie at room temperature or warm, with lightly sweetened whipped cream or vanilla ice cream. If you want warm up the cooled pie, warm it in a 250F oven for about twenty minutes.